- Standard member, no referral. - Requested 01 November, full bal. - Average: 4¢ / day. > Free Member PTP: $0.2 CPM. > Minimum payment is $5.00. > Referral Commission: 10%. 0% activity requirement to earn from your downline. China, Hong Kong, Taiwan, Japan, Afghanistan, Nigeria, Yemen, Pakistan and Saudi Arabia. 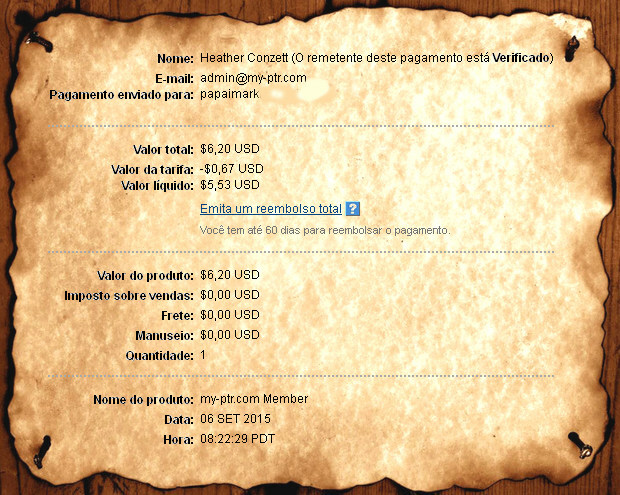 1º prova de pagamento de My-PTR.com . - Recebido 53 dias após requerer. - Média: 4¢ por dia. - Requested 03 March when reached $5; full bal. > Minimum payment is $5.00. Maximum is $10. 2º prova de pagamento de My-PTR.com . - Requerido em 03 de março. - Média: 6,1¢ por dia. I suppose this happens because the maximum amount to request is $2,50. After paid, a member must wait all other members that requested po to be paid. The exceeding money overflows sooner or later. - Requested when reached $5; full bal, about 30 days ago. > Read the non allowed countries before registering. - Requested 01Dec, the first request after all other requests were paid. > 300~500 $0,0001 to $0,005 ads. $3 from DreamMails, $3 from My-PTR and $3 from StCashUnlimited. - Paid in one day. The blue tag above the picture seems to be darker, but it is not.